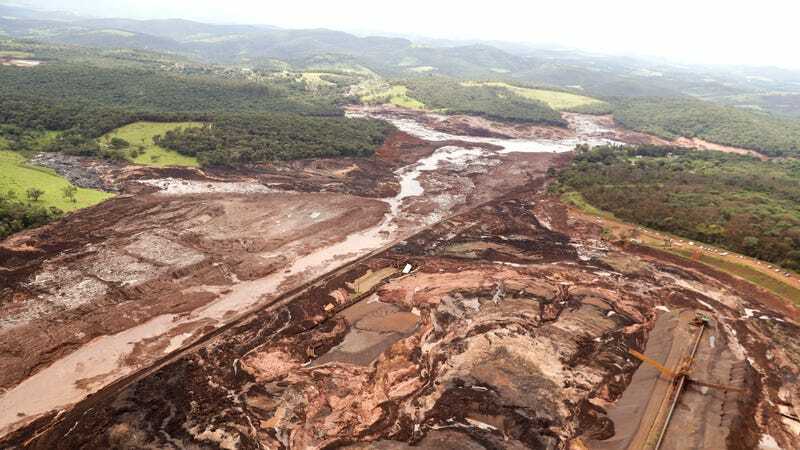 The aftermath of a dam collapse near Brumadinho, Brazil on Jan. 26, 2019. Authorities said this weekend that the death toll from an industrial disaster in Brumadinho, Brazil in Minas Gerais state has climbed to at least 34, with some officials saying that the true toll could reach the hundreds, the Wall Street Journal reported on Saturday. The sludge that buried the area is hardening fast, rescue officials told Ms. Carolina and other lawmakers visiting the site, making rescue attempts even more difficult and dimming the chances of finding survivors. Rescue workers have also pulled dozens of survivors from the thick, slippery mud. The number of people who are unaccounted for continues to change, as more people are reported missing and others get in touch with co-workers, family members or authorities. The current estimate is that about 300 people are still missing. Vale Chief Executive Fabio Schvartsman said at a press conference on Friday that Vale’s work facilities and nearby living areas were flooded so quickly that anyone alerted to the disaster would have no time to escape, the Journal added. At least 256 people remain missing, CNN reported. Rescue workers recovering bodies in the wake of a mining disaster near Brumadinho, Brazil on Jan. 26. A bridge destroyed in the wake of a mining disaster in Brumadinho, Brazil on Jan. 26. “We know now that the chances of having survivors are minimal and that we will probably rescue bodies,” state governor Romeu Zema said, the Observer wrote. While the cause of the accident has not yet been determined, the Brazilian environmental agency, Ibama, has already slapped Vale with a 250 million reais (about $66 million USD) fine for causing pollution, destroying the habitability of the environment, and other “other regulatory violations,” the Observer noted. Prosecutors have also moved to freeze roughly $1.3 billion in Vale funds for relief efforts. Per the Observer, Vale said the mine was judged safe during inspections and that it was being decommissioned at the time of the disaster, though the National Civil Society Forum for Hydrographic Basins said it had urged authorities to deny Vale a license renewal. An Ibama official also said during a meeting last year that some locals were “very worried, with good reason.” Another Ibama official, speaking anonymously to the Observer, questioned how a company reckless enough to build an administrative complex at the bottom of a mining-waste dam continued to get approval. The New York Times noted that the mining disaster is also a political crisis for new President Jair Bolsonaro, a far-right politician who openly mocked environmental regulations on the campaign trail. He labeled environmental fines an “industry” that must be eliminated and promised to open up large swathes of protected land to mining operations, the Times wrote.